Explanation: When we celebrate the start of 2019, on January 1 the New Horizons spacecraft will flyby Ultima Thule. A world of the Kuiper belt 6.5 billion kilometers from the Sun, the nickname Ultima Thule (catalog designation 2014 MU69) fittingly means "beyond the known world". Following its 2015 flyby of Pluto, New Horizons was targeted for this journey, attempting the most distant flyby for a spacecraft from Earth by approaching Ultima Thule to within about 3500 kilometers. The tiny world itself is about 30 kilometers in size. This year, an observing campaign with Earth-based telescopes determined the shape of the object to be a contact binary or a close binary sytem as in this artist's illustration. 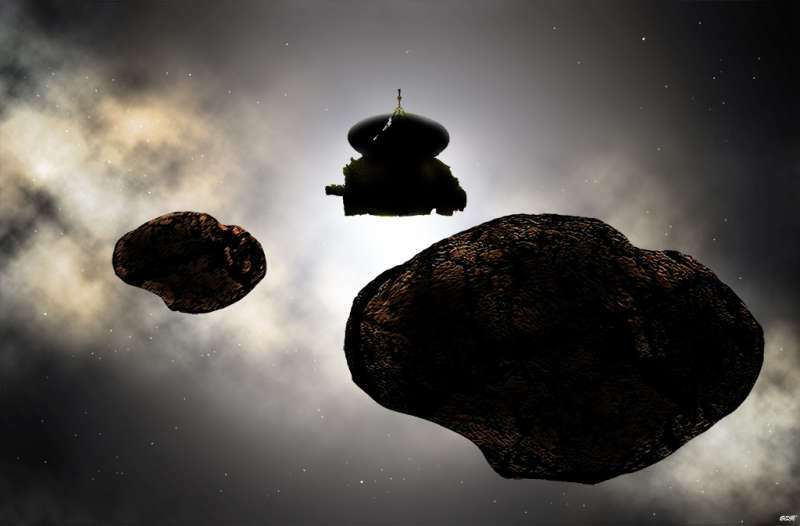 New Horizons will image close up its unexplored surface in the dim light of the distant Sun. 2003 UB 313: A Tenth Planet?